How Far is Triguna's Ashwatha? Triguna's Ashwatha at Yelahanka, off Kogilu main road, is a beautiful residential project comprising 58 apartments ably complimented by excellent amenities. 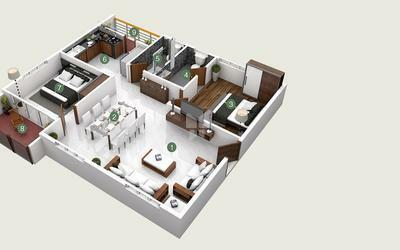 Ashwatha offers 2 & 3 BHK apartments planned as per vaastu principles and optimized natural light utility. • Kitchen : Glazed Ceramic Tiles Dado upto 2' Height above kitchen platform. • Toilets: : Glazed Ceramic Tiles Dado of Reputed make upto 7' Height. • Kitchen: : Granite platform with Stainless Sink including water connec and provision for water purifier. Flush door with Melamine Polishing and reputed make SS Hardware fittings. • Internal: 2 coats Premium Emulsion Over 2 coats putty and 1 coat primer of Asian Tractor Emulsion/Equivalent. • Acoustic Enclosed DG set back up for all common areas and 1 KVA for each flat.